They originally roamed the steppe regions of Eurasia, but the last wild herds retreated to the deserts. Mongolia and China and in zoos around the world. Przewalski’s horses grow a dense coat for very cold winters and shed into a lighter coat for very hot summers. Their tan coloration helps them blend into their grassland and desert habitat. 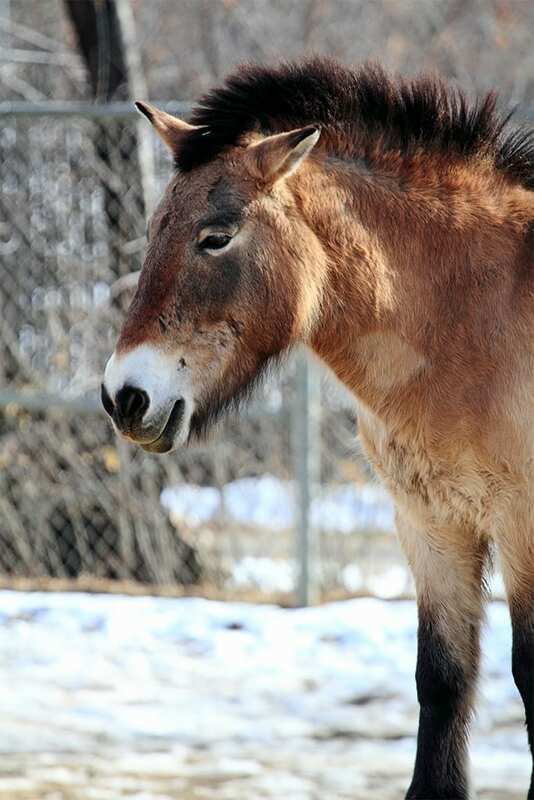 Like most prey species, the Przewalski’s horse has large eyes located on the sides of the head. They are able to see all around except directly behind them even when their head is down while they are grazing or drinking. They weigh 550-850 pounds (247-383 kg). Przewalski’s horses stand 12-14 hands or 48-58 inches (120-146 cm) tall at the shoulder. They have tan to reddish brown fur with white on the belly, dark brown on the lower legs and a white muzzle. They have a stiff, dark brown mane. Przewalski’s horses have a stocky build with short legs. In the wild: Grasses, leaves and bark. At the zoo: Hay, grain, vitamin and mineral supplements. Wolves and humans prey on Przewalski’s horse. The Przewalski’s horse is a very social animal forming herds consisting of one stallion and four to 10 mares with their offspring. The stallion is responsible for the herd’s protection and coordinates daily movements of the group as they wander to graze, drink or rest. Herds don’t mix but will share territory because the stallions are more protective of their mares than their territory. Yearling males join bachelor groups led by an older stallion until they are mature enough to attract their own females. Przewalski’s horses are sexually mature at about two years of age but males are usually at least three years old before they are strong enough to collect a harem of females. Mating occurs in April or May and a single foal is born nearly a year later. Foals are usually born at night and by morning are able to travel with the herd. Foals begin grazing within a few weeks but continue to nurse for eight to 13 months. Females may remain with the herd but males are driven away after a year. Lifespan for the Przewalski’s horse is 20-25 years. The Przewalski’s horse has never been domesticated and is the only remaining species of wild horse. 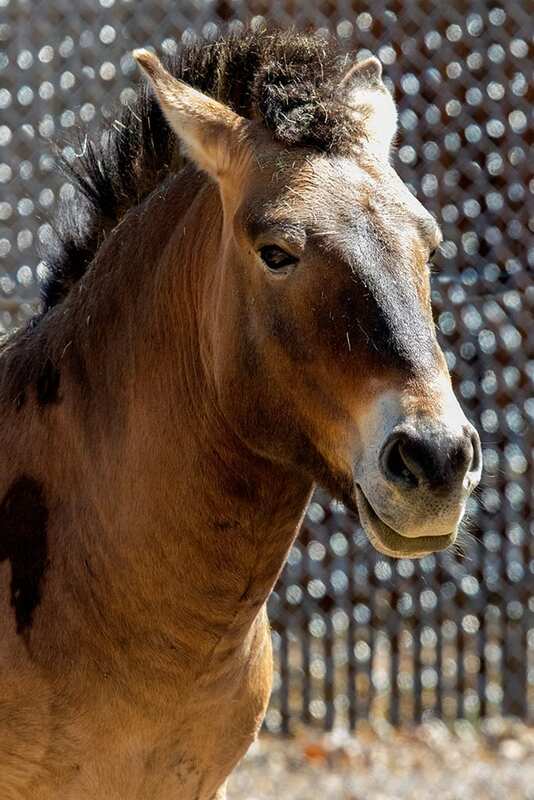 The Przewalski’s horse was named after Nikolai Przhevalsky, a Russian officer and land surveyor, who was the first European to bring evidence of this mythical wild horse to the tsar of Russia. Przewalski’s horses shed hair on their tail and mane all at once, unlike domestic horses that lose only a few hairs at a time. Przewalski’s horse is also known as the Mongolian wild horse and the takhi – a Mongolian word meaning “spirit”. The Przewalski’s horse was extinct in the wild for over 30 years after the last wild populations died out in the 1960’s. In 1992, sixteen captive-bred horses were reintroduced into protected areas in the steppe region of Mongolia followed later by additional animals. As of 2005, there was a free-ranging population of 248 Przewalski’s horses in the wild. The current world population is about 1500 all descended from 13 animals placed in zoos in the early 1900’s.